California valley quail are small, attractive birds popular with hunters as well as the bird lovers who sometimes keep them for pets. These birds are so much a part of life throughout much of California that the valley quail is the official state bird and can be found throughout much of the region. Male California quail are gray on their back and breast, with black, white and brown undersides in a distinctive scale-like pattern. Males also have a black throat accented by white lines on both sides as well as above its eyes. Females have similar body colorings, though more subdued, and lack the throat and face markings of the male. The first thing you’re likely to notice about the California quail is the little group of six feathers on top of its head, shaped a bit like a question mark or a comma. These feathers, called a topknot, make it almost impossible to mistake this 10-inch long bird for any other species. The topknot is bigger and more pronounced on the male, but it’s present on both sexes. Quail typically run from danger, rather than fly. This helps them to avoid aerial predators such as hawks and eagles. Coyotes, fox, snakes and other animals prey on them, but the speedy quail can often escape by out-maneuvering these animals in the scrub where they live. If pushed too far, they eventually will burst into flight to get away. California quail often live in hot, dry areas where water is scarce, but they are able to get some of their needs met by eating succulent vegetation with a high moisture content. The insects the quail catch and eat also help to supply them with moisture. Some birds may choose to live near a reliable water source. They often eat nuts, berries and seeds and depend on protozoa in their intestines to digest these foods. Baby quail pick up the protozoa by pecking at the droppings of the adult birds. 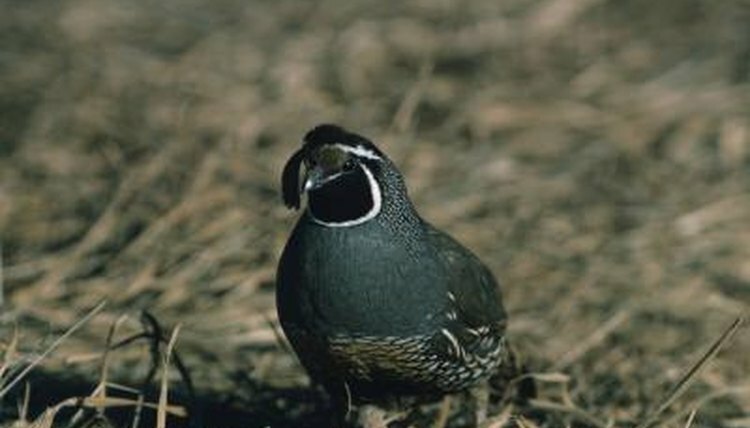 Coveys containing hundreds of related quail are common throughout much of the year. During the breeding season each pair of birds makes individual depressions in the ground where they will brood an average of 14 eggs for about 22 days. If something happens to the female the male may take over brooding duties. Otherwise he is there to protect her as she sits on the eggs. The California quail is native to southernmost Oregon, western Nevada, throughout California and as far south as Baja California in Mexico. It adapts well to other suitable areas and can be found as far north as the southern portion of British Colombia in Canada and scattered throughout Idaho, Washington, Utah and northern Oregon. Humans successfully have introduced these quail in Chile, Australia and New Zealand as well as the Santa Rosa Islands off the coast of California. Utah Division of Wildlife Resources: Upland Game: What are California Quail Doing in Utah?